Discarded solar panels are ending up in landfills, instead of being recycled, where toxic solar panel waste is leaking into the ground and water. Solar photovoltaic panels, whose operating life is 20 to 30 years, lose productivity over time. The International Renewable Energy Agency estimated that there were about 250,000 metric tons of solar panel waste in the world at the end of 2016 and that the figure could reach 78 million metric tons by 2050. Solar panels contain lead, cadmium, and other toxic chemicals that cannot be removed without breaking apart the entire panel. While disposal of solar panels has taken place in regular landfills, it is not recommended because the modules can break and toxic materials can leach into the soil, causing problems with drinking water. Solar panels can be recycled but the cost of recycling is generally more than the economic value of the material recovered. Used panels are also sold to developing world countries that want to purchase them inexpensively despite their reduced ability to produce energy. Regardless, solar panel waste disposal is a problem that needs to be addressed. Washington State is the only U.S. state that requires the manufacturer to develop a recycle plan, but the state requirement does not address the cost of recycling. Adding a fee to the cost of solar panels would help ensure that the disposal issue is addressed in the event that the manufacturer goes bankrupt. Since 2016, at least seven solar panel manufacturers (Sungevity, Beamreach, Verengo Solar, SunEdison, Yingli Green Energy, Solar World, and Suniva) have gone bankrupt. Because California’s solar panels end up in landfills at the end of their useful life, the state is in the process of implementing regulations to change that. California’s Department of Toxic Substances Control (DTSC) held a meeting with solar and waste industry representatives to discuss the disposal issue. The representatives and DTSC acknowledged that it would be difficult to determine whether a used solar panel should be classified as hazardous waste. The DTSC suggested building a database where solar panels and their toxicity could be tracked by their model numbers, but it is not clear whether DTSC will implement such a data base. Natural events such as hail storms, tornadoes, hurricanes, earthquakes, etc. can cause damage to the panels. For example, in 2015, a tornado broke 200,000 solar modules at southern California’s solar farm Desert Sunlight. More recently, the second largest solar farm in Puerto Rico, generating 40 percent of the island’s electricity, was severely damaged during Hurricane Maria. With 100,000 pounds of cadmium contained in 1.8 million solar panels calculated for a proposed 6,350 acre proposed solar farm in Virginia, any breakage is a cause for concern. Further, even rainwater has been found to flush out cadmium within an intact solar panel. The biggest problem with solar panel waste may be its large quantity. Because sunlight is dilute and diffuse, large collectors are required to capture and convert the sun’s rays into electricity. 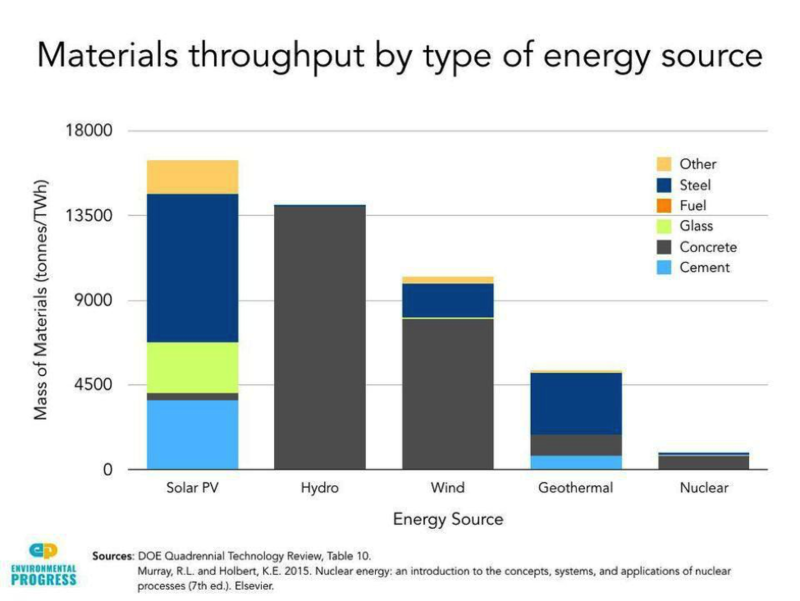 Those large surface areas require an order of magnitude more materials (glass, heavy metals, and rare earth elements) than other energy sources. Approximately 90 percent of most PV modules are made up of glass. However, this glass often cannot be recycled due to impurities such as plastics, lead, cadmium and antimony in the glass. Manufacturers are lowering the cost of manufacturing solar panels by reducing the silver content in their modules. 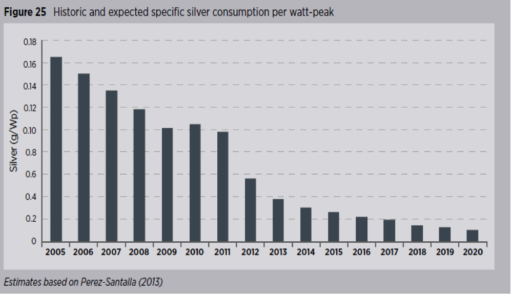 Although silver makes up a very small fraction of the mass of a solar panel, it makes up about 47 percent of its value, which lowers the incentive for a recycler to recycle a panel. Silver is worth significantly more than other recoverable components such as aluminum, copper, silicon and glass. Manufacturers are able to reduce the silver content by using inkjet and screen printing technologies to replace it with a combination of copper, nickel and aluminum and by smarter manufacturing techniques that are more precise about the minimum amount of silver that is required. 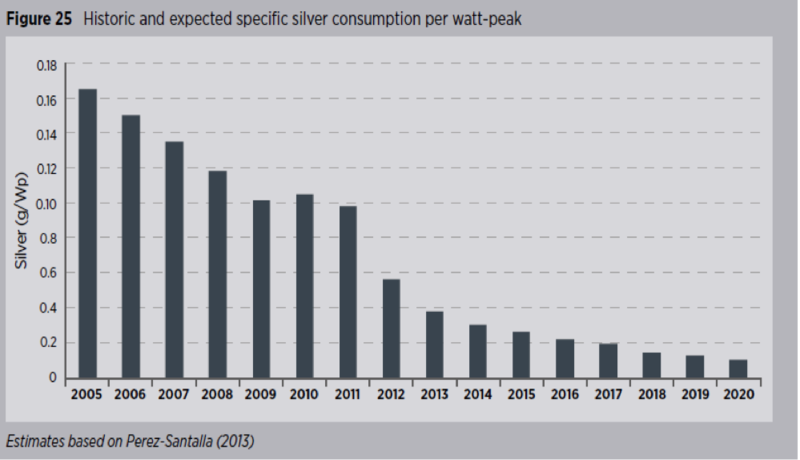 The decrease in silver makes recycling a larger challenge from a value perspective since there is less silver to recover from the modules. A fee imposed on solar panel purchases to make sure that the cost of safely removing, recycling or storing solar panel waste is internalized into the price of solar panels and not externalized onto future taxpayers would aid the disposal issue. A fee imposed on solar panels could go into a federal disposal and decommissioning fund, which would be dispensed to state and local governments to pay for the removal and recycling or long-term storage of solar panel waste. The fund would insure that solar panels are safely decommissioned, recycled, or stored over the long-term, even if solar manufacturers go bankrupt. This is similar to the funds established for nuclear waste disposal and the abandoned mines program affecting coal mining reclamation in the United States. Nations importing used solar panels might also impose a fee to cover the cost of recycling or long-term management. Because there is a large quantity of material to track, coordinated responses at the international, national, state, and local levels are needed. The local level is where action to dispose of electronic and toxic waste takes place, often under state mandates. Because industry prefers to comply with a single national standard, it would be preferable to multiple state standards. Further there may need to be an international regulation as the secondary market for used solar panels grows. The growth in solar panel waste worldwide is large and needs to be addressed as it is expected to get larger. Currently, much of the waste is disposed at landfills where the toxic chemicals can leach into the soil. More needs to be done to regulate the disposal of used solar panels on the national and international level. Just mandating a recycle plan may be insufficient as recycling costs are generally more than the economic value of the materials they recover, and companies may not be around long enough to fulfill their obligations under such a scheme. A fee added to the cost of the solar panels would help to insure that they are properly disposed. One of the more hidden problems with solar is technology risk. On the one hand, there is the early failure of solar panels, and on the other, new technology will make old solar totally uneconomic. In reading this fine article, the quote from “The Graduate” in which an elitist businessman takes aside the young Benjamin Braddock (Dustin Hoffman) and declares, “I just want to say one word to you — just one word — ‘plastics.’ jumped in my head. Yep, you need petroleum derived products like “plastics’ to be “green”….oh, the irony. No where in the article was the use of plastic encouraged. The article merely reveals environmental impacts related to solar energy that those promoting it so heavily like to ignore. But to your comment, at least plastics are easily recycled and there are recycling programs for plastics, while there are currently no real recycling efforts aimed at solar products and, as the article pointed out, no real economic incentive for recycling the panels. I have a couple of solar panels that are approximately 2ft x 4ft in size (very expensive for the minuscule amount of energy output). I expect those will be serviceable for my purposes for years, yet at some point they will become “residential” trash. Will there be any recycling for these items in the future or will they simply go into landfills?